Guru Nyima Özer (Skt. Sūryaraśmi; Tib. གུ་རུ་ཉི་མ་འོད་ཟེར་, Wyl. gu ru nyi ma 'od zer; Eng. 'Rays of the Sun') — one of the Eight Manifestations of Guru Rinpoche. Guru Rinpoche manifested as a number of great siddhas, such as Saroruha—the master who revealed the Hevajra Tantra—as well as Saraha, Dombiheruka, Virupa, and Krishnacharin. 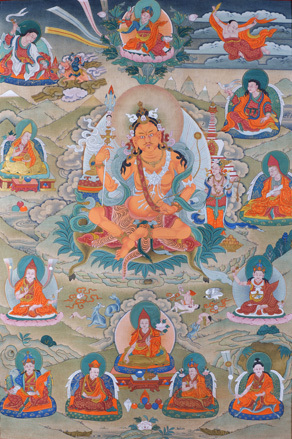 In charnel grounds like Kuladzokpa, 'Perfected in Body', he taught the secret mantra to dakinis and made outer and inner spirits into protectors of the Dharma. He was then known as Nyima Özer, 'Rays of the Sun'. This page was last edited on 9 July 2016, at 07:35.